Finds all occurrences of a predefined template on an image by analysing the normalized correlation between pixel values. Detection of objects with blurred or unclear edges. Often one of the first filters in a program. The operation matches the object model, inGrayModel, against the input image, inImage. The inSearchRegion region restricts the search area so that only in this region the centers of the objects can be presented. The inMinScore parameter determines the minimum score of the valid object occurrence. The inMinDistance parameter determines minimum distance between any two valid occurrences (if two occurrences lie closer than inMinDistance from each other, the one with greater score is considered to be valid). The computation time of the filter depends on the size of the model, the sizes of inImage and inSearchRegion, but also on the value of inMinScore. This parameter is a score threshold. Based on its value some partial computation can be sufficient to reject some locations as valid object instances. Moreover, the pyramid of the images is used. Thus, only the highest pyramid level is searched exhaustively, and potential candidates are later validated at lower levels. The inMinPyramidLevel parameter determines the lowest pyramid level used to validate such candidates. Setting this parameter to a value greater than 0 may speed up the computation significantly, especially for higher resolution images. However, the accuracy of the found object occurrences can be reduced. Larger inMinScore generates less potential candidates on the highest level to verify on lower levels. It should be noted that some valid occurrences with score above this score threshold can be missed. On higher levels score can be slightly lower than on lower levels. Thus, some valid object occurrences which on the lowest level would be deemed to be valid object instances can be incorrectly missed on some higher level. The diagMatchPyramid output represents all potential candidates recognized on each pyramid level and can be helpful during the difficult process of the proper parameter setting. To be able to locate objects which are partially outside the image, the filter assumes that there are only black pixels beyond the image border. The outObjects.Point array contains the model reference points of the matched object occurrences. The corresponding outObjects.Angle array contains the rotation angles of the objects. The corresponding outObjects.Match array provides information about both the position and the angle of each match combined into value of Rectangle2D type. Each element of the outObjects.Alignment array contains informations about the transform required for geometrical objects defined in the context of template image to be transformed into object in the context of corresponding outObjects.Match position. This array can be later used e.g. by 1D Edge Detection or Shape Fitting categories filters. Connect the inImage input with the image you want to find objects on. Make sure that this image is available (the program was previously run). Click the "..." button at the inGrayModel input to open the GUI for creating template matching models. The template region you select on the first screen should contain characteristic pixel patterns of the object, but should not be too big. Make sure that the inMinAngle / inMaxAngle range corresponds to the expected range of object rotations. If you expect the object to appear at different scales, modify the inMinScale and inMaxScale parameters. Use it with care as it affects the speed. Do not use simultaneously wide ranges of rotations and scaling as the resulting model may become extremely large. On the second page (after clicking "Next") define the object rectangle that you want to get as the results. Please note that the rotation of this rectangle defines the object rotation, which is constrained by the inMinAngle / inMaxAngle parameters. If an object is not detected, first try decreasing inMaxPyramidLevel, then try decreasing inMinScore. However, if you need to lower inMinScore below 0.5, then probably something else is wrong. If all the expected objects are correctly detected, try achieving higher performance by increasing inMaxPyramidLevel and inMinScore. Please note, that due to the pyramid strategy used for speeding-up computations, some objects whose score would finally be above inMinScore may be not found. This may be surprising, but this is by design. The reason is that the minimum value is used at different pyramid levels and many objects exhibit lower score at higher pyramid levels. They get discarded before they can be evaluated at the lowest pyramid level. Decrease inMinScore experimentally until all objects are found. If precision of matching is not very important, you can also gain some performance by increasing inMinPyramidLevel. If the performance is still not satisfactory, go back to model definition and try reducing the range of rotations and scaling as well as the precision-related parameters: inAnglePrecision and inScalePrecision. Define inSearchRegion to limit possible object locations and speed-up computations. Please note, that this is the region where the outObject.Point results belong to (and NOT the region within which the entire object has to be contained). Smoothing of the input image can significantly improve performance of this tool. 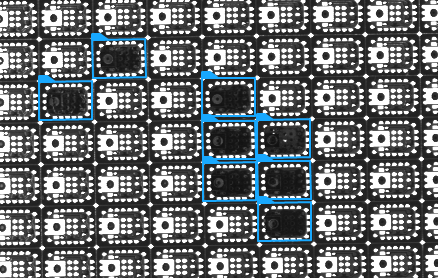 Description of usage of this filter can be found in examples and tutorial: Missing Chip, Gray-based Template Matching: Missing Chip . Locating multiple objects with the gray-based method (inMaxPyramidLevel = 2). Please note, that the edge-based method might not work properly here, because what we are looking for (a missing chip) is a sub-object of what we are not looking for (a correct chip). For more information about local coordinate systems please refer to the following article. More informations about creating models can be found in article: Creating Models for Template Matching. This operation is optimized for SSE2 technology for pixels of type: UINT8. This filter is member of LocateObjects_NCC filter group. CreateGrayModel – Creates a model for NCC or SAD template matching. LocateMultipleObjects_SAD – Finds multiple occurrences of a predefined template on an image by analysing the Square Average Difference between pixel values. LocateSingleObject_NCC – Finds a single occurrence of a predefined template on an image by analysing the normalized correlation between pixel values.